I’m not sure quite when Little Miss C became old enough to be interested in nail polish, but it’s happened. 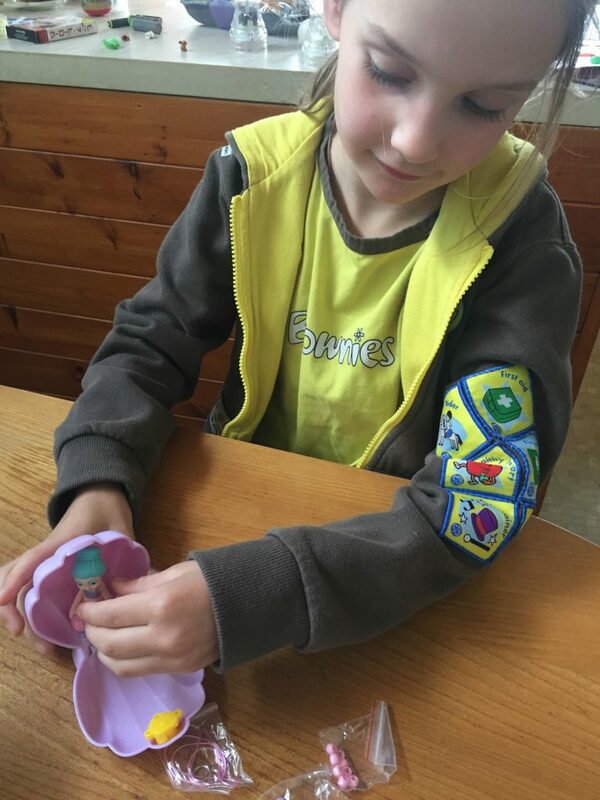 She’s due to turn eight next week and now the magazines she chooses come with nail polish on the front cover, and at the school fair she spent her pocket money on getting her nails done. I would previously have ignored a request to review something like the Num Noms Nail Polish Maker. I would have dismissed it as being a bit too old for her. Now though I need to accept that she’s growing up and nail polish is exactly the kind of thing that she’s interested in! Friday 1 June was national nail polish day, making it the perfect time to review the Num Noms Nail Polish Maker. Although, so out of touch am I with girly things like that, that I hadn’t even realised national nail polish day was a thing! 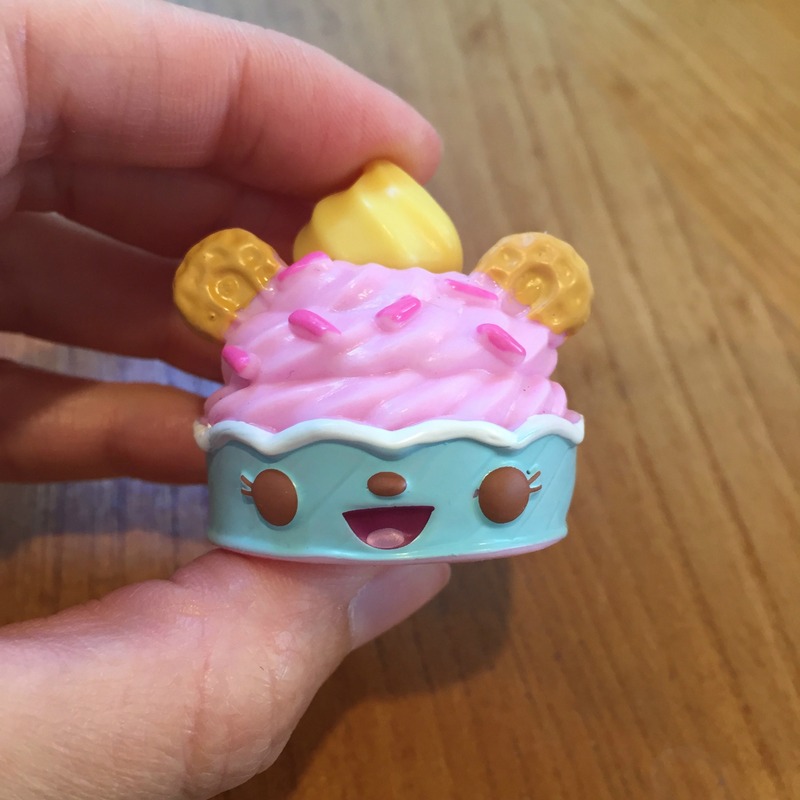 LMC has been a fan of Num Noms since we were first introduced to them a couple of years ago. Since then she’s used her pocked money buy loads of the collectables, and also frequently chosen the Num Noms magazine when we’ve been on supermarket shopping trips together. 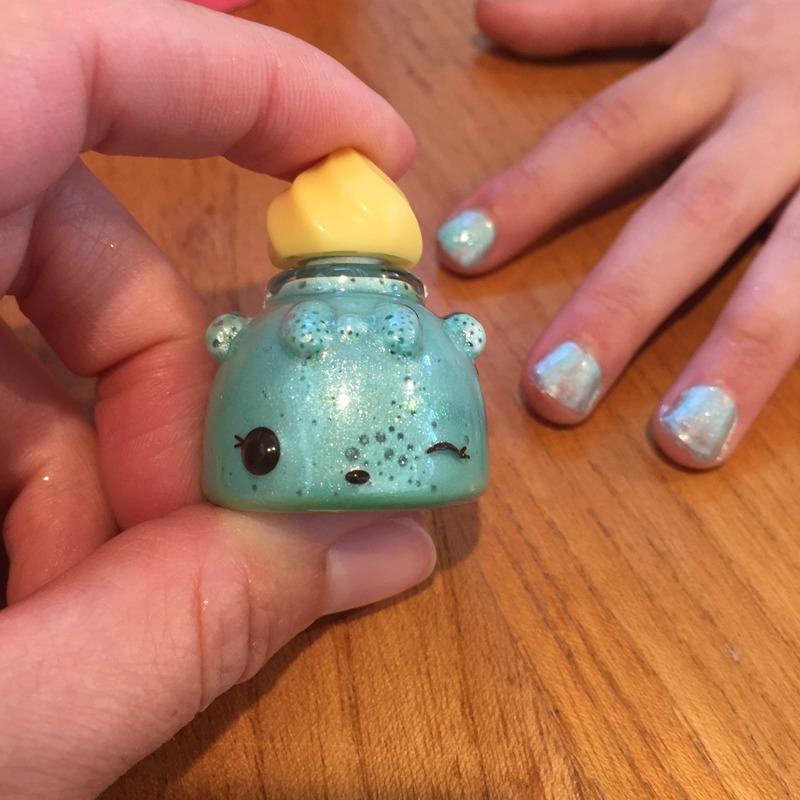 The combination of Num Noms with a nail polish maker is a perfect match. I can’t deny that the Num Noms Nail Polish Maker is somewhat larger than I was expecting. Significantly so. The main section of it looks like a cafe – with the components that make up the nail polish in dispenser like bottles over the counter. The set comes with three empty nail polish bottles that you can fill up from the ingredients in the nail polish maker. They’re incredibly cute! 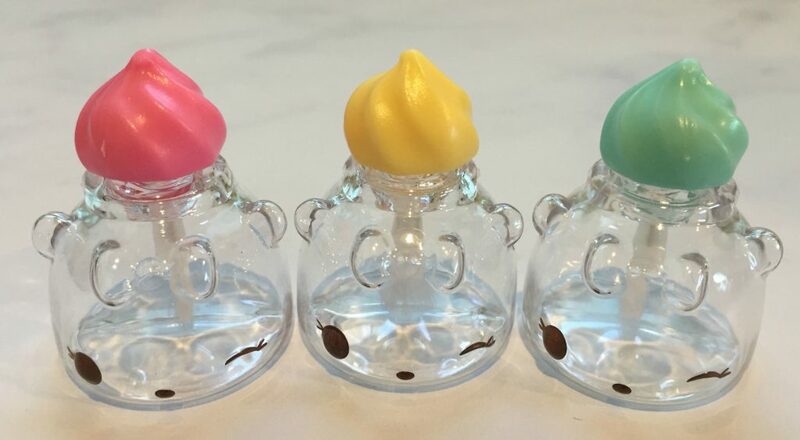 The bottles are shaped just like Noms, and so fit inside a Num with an appropriate hole in the top for the bottle lid to go. 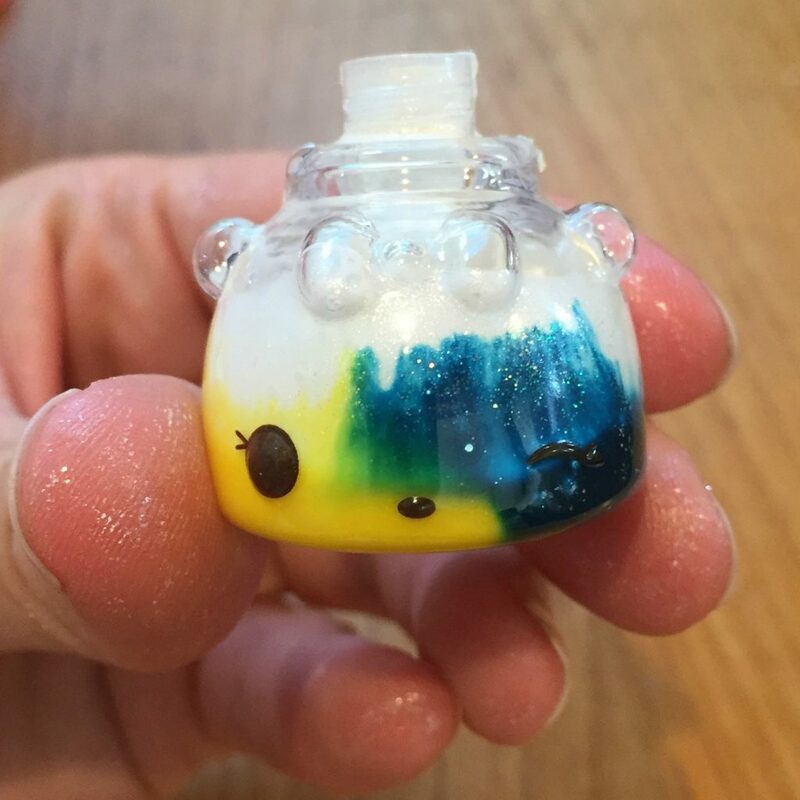 The Num Noms Nail Polish Maker set comes with a Nom which its the nail polish bottle Nums inside it. 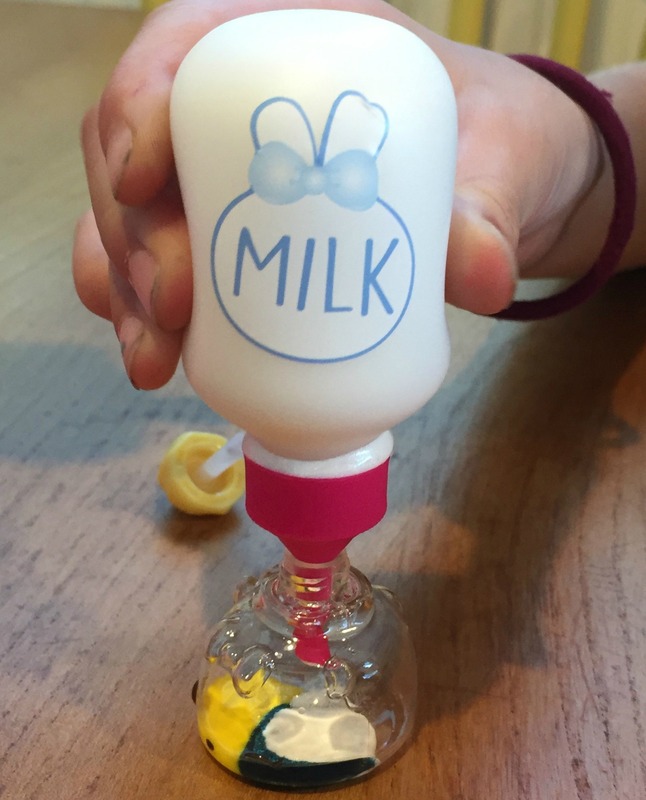 Children then use the three different scented colours (Yellow Banana, Blue Blueberry and Red Strawberry) to make the desired colour of nail polish, by adding them to the Nom shaped bottle. Along with a squeeze of glitter if they so desire. After a few drops of the chosen colours, the bottles are then topped up by the base pearl colour. Or “milk” as it is known in Num Nom land! Once this is done the nail polish needs mixing. This can either be done by good old shaking, or using the mixing part of the Num Noms Nail Polish Maker. You fit the bottle in (which is a bit fiddly) and then just turn the handle until it is mixed. To be honest though we found shaking far more effective! Once the polish is mixed you can then use the finger stool (two are included) to paint your nails. These can clip in the back of the nail polish maker shop, but I found that there was then a problem with not having enough space to actually paint the nails. So instead I just used the finger rest on its own. 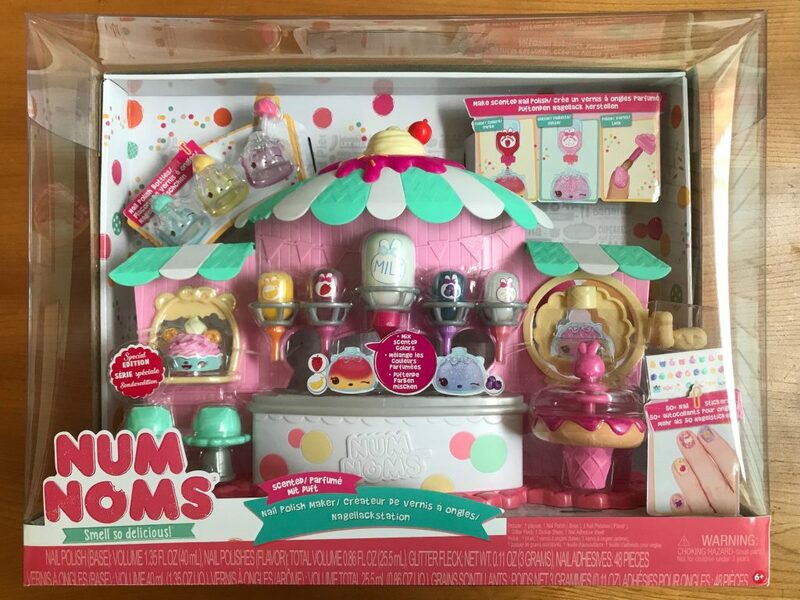 As well giving you everything to make the nail polish, the Num Noms nail polish maker also comes with stickers that you can use on your painted nails. Also included are two sets of plastic nails. These can be decorated on the Donut Table and then attached to your own nails using the nail adhesives included. 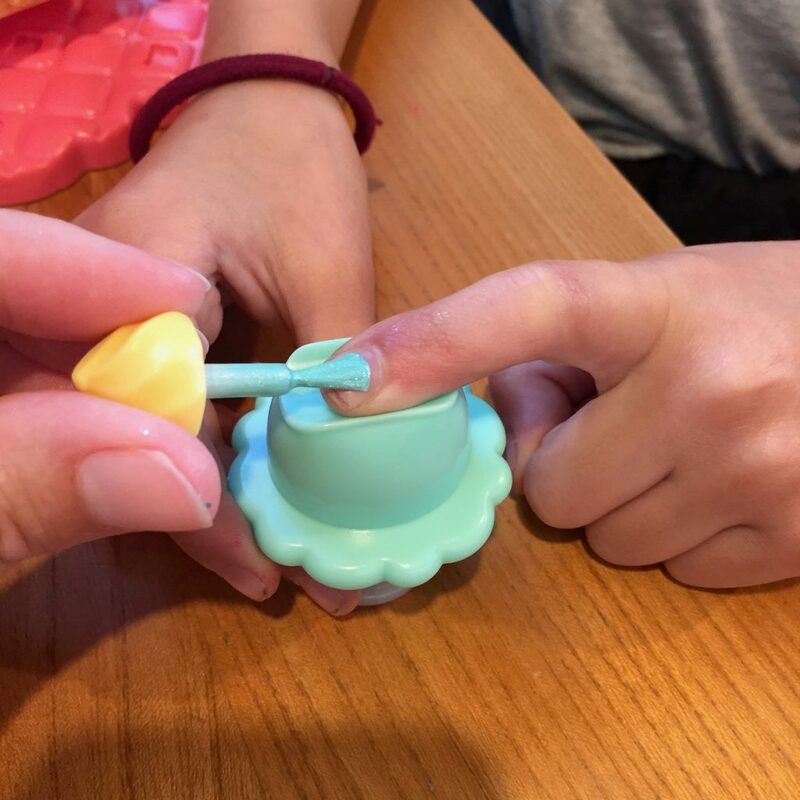 Little Miss C really liked the Num Noms Nail Polish Maker, but there’s a but… The big draw back that I see is the you can’t buy refills or replacement nail polish pots. This means that once you’ve used up the flavourings and glitter in the maker you can’t make any more. It seems a bit of a shame. This also means that if your kids make all three bottles of polish straight away it’s somewhat finished as a nail polish maker. However, on the plus side, the nail polish maker is cafe themed. This means that even once you’ve finished you could still use it as a regular Num Noms cafe play set. I do think that Num Noms have missed a trick though as surely selling replacement ingredients and pots would be a good thing. I’d expect them to have a price point that would work perfectly for pocket money toys too. Being eight years old, Little Miss C didn’t really think through the longevity of the nail polish maker in terms of future use. I’m expecting her to be a bit disappointed though when she realises that she can’t make any more nail polish with it. The actual making part is great fun, but again rather fiddly. I ended up doing most of it with LMC helping. A slightly older child might manage the whole thing alone, but do be prepared to help if you don’t want a huge mess. 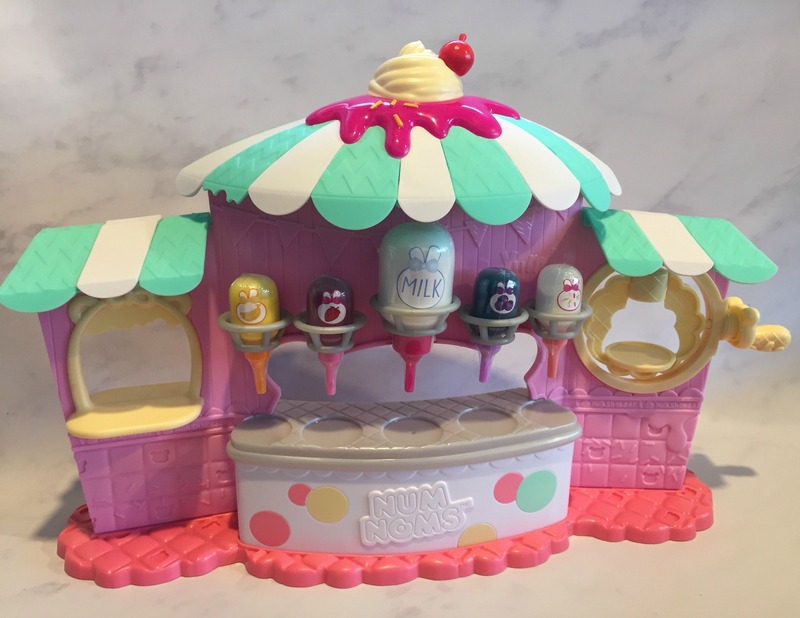 The Num Noms Nail Polish Maker is available to buy online here. The RRP is £50, but it is often available for significantly less. At the time of writing you can get it for £29.89 on Amazon UK. 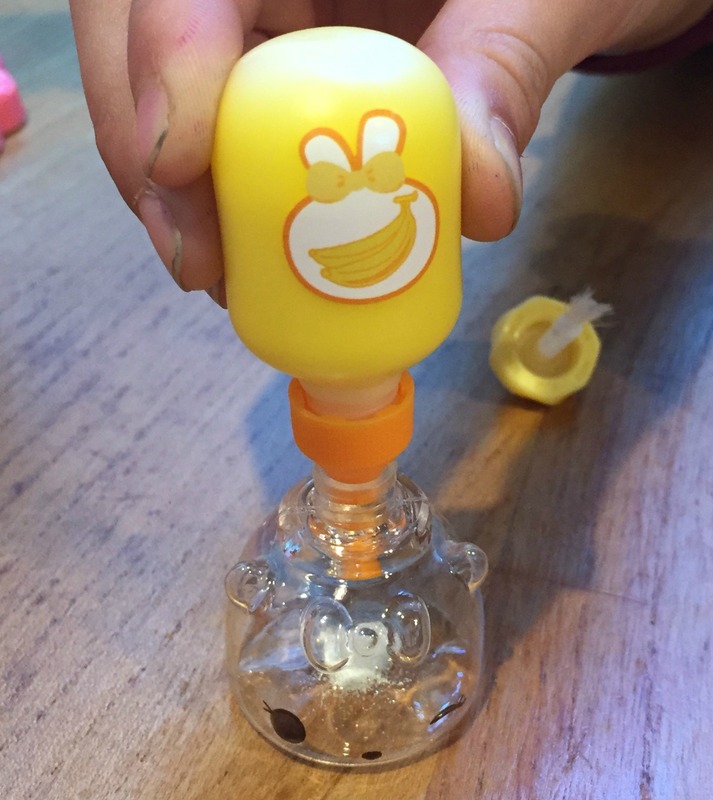 Disclaimer: We were sent the Num Noms Nail Polish Maker for the purposes of this review. All opinions remain my own. This post contains affiliate links. It’s a little while since Little Miss C helped me review Marina’s Lagoon from the My Mermaid Lagoon range. She really enjoyed setting it up originally and still plays with the figure and other accessories in her bedroom. She was therefore thrilled when I brought home the Serena Charm Shell from the same range from Blog On X. 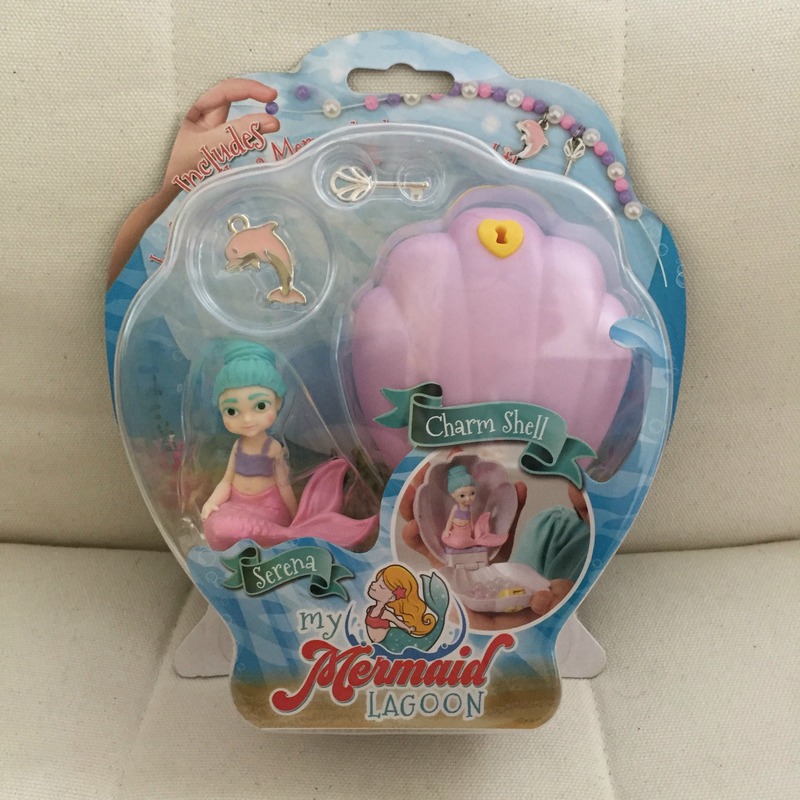 Smaller than the original Lagoon sets this Charm Shell consists of a mermaid figure and a lockable charm shell. You an sit the mermaid in the shell and it also has in it a secret compartment (under her seat). The set also comes with everything needed to make a charm bracelet. The key for the shell goes on the bracelet and can be kept safely there. LMC loves anything crafty and has recently been going through a phase of making jewellery so this was perfect for her. 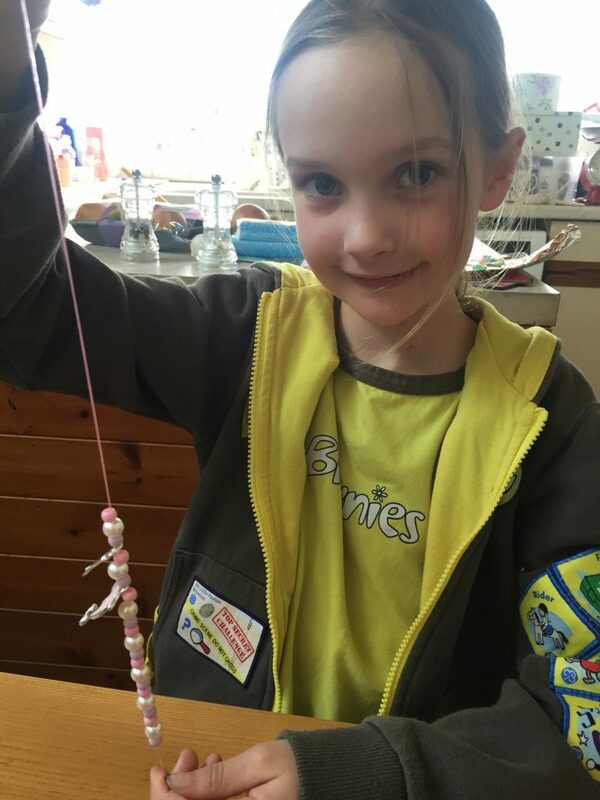 Apart from a bit of help knot tying she was able to make the bracelet without any other assistance. She particularly loved the fact that it meant she could keep the key for the shell safe and therefore stop her younger brother from being able to get in! Miniature world play is something that LMC still loves and so it is no surprise that the Serena the mermaid and her shell have become part of her play world. She has a variety of characters that she plays with regularly, and some of them it seems now live in the charm shell with Serena. 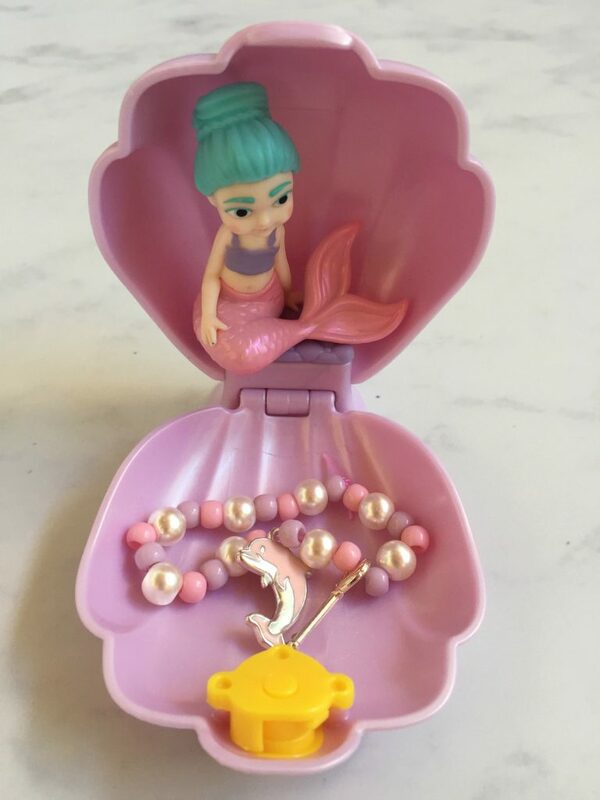 The My Mermaid Lagoon Charm Shell is perfect for mermaid loving children who are into small world play and who love making things. This set gives children something much longer lasting than just having a quickly completed bracelet making activity set. It’s also really nice for them to have somewhere special to now keep their treasured items. You can buy the My mermaid Lagoon Serena Charm Shell online here. At the time of writing the RRP is £9.99, but online discounts are available. 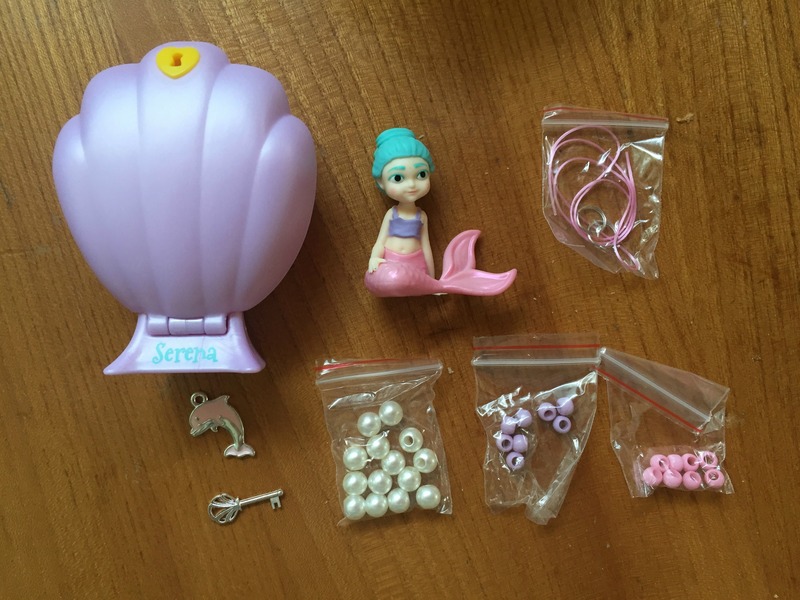 Disclaimer: We were given the My Mermaid Lagoon Serena Charm Shell for the purposes of this review. All opinions are my own. This post contains affiliate links. It may not have escaped your notice but there is a lot of red, white and blue around right now. Not only is there a new Royal baby, but there’s also a Royal Wedding fast approaching. 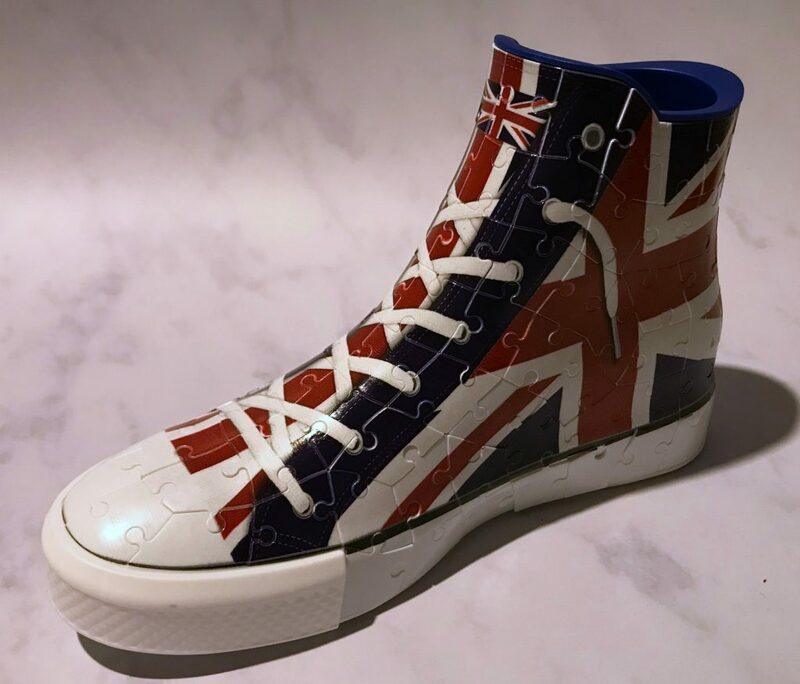 The prospect of getting out the Union Jack bunting may not excite everyone, but it does mean that brands are using every opportunity to become as patriotic as possible. 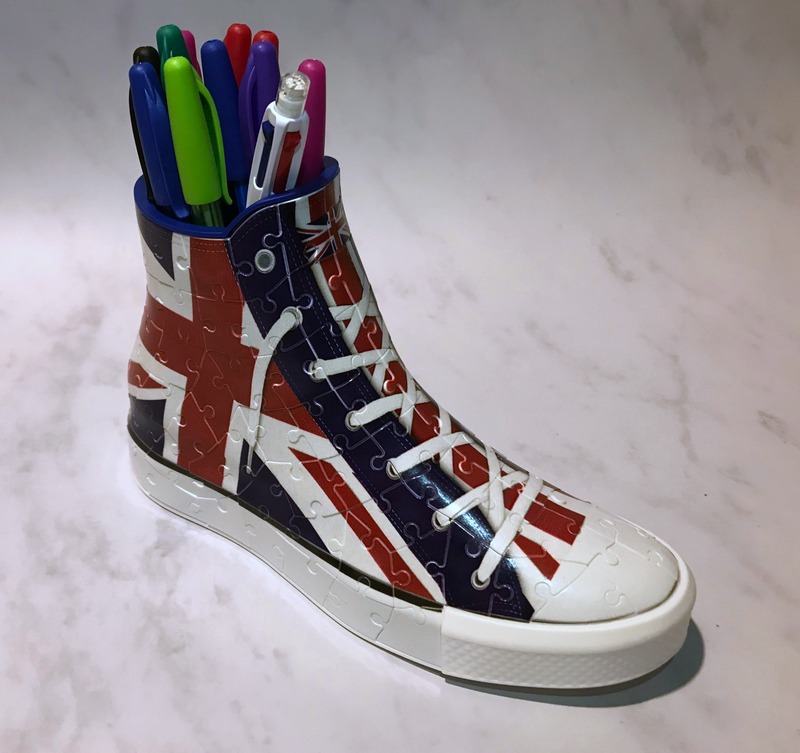 I’m pretty sure the Ravensburger Union Jack 3D Sneaker puzzle was already in their range, but what a perfect excuse to promote it more. 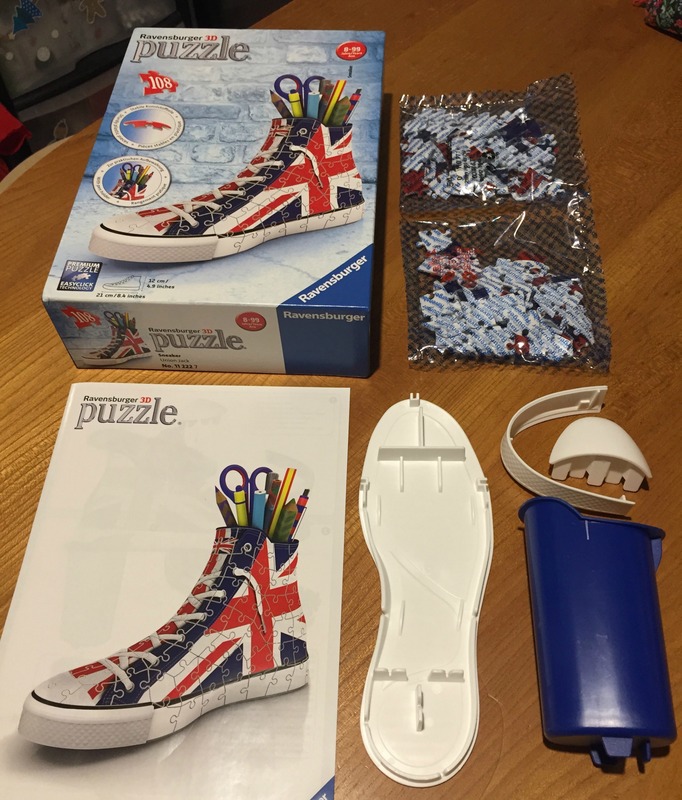 We’re lucky enough to have reviewed one of these Ravensburger 3D Sneaker puzzles before, but it was such a hit that we were more than keen to have a go at this different design. The way these 3D puzzles work is that the puzzle pieces are made out of plastic and interlock. This means that they hold the shape of the 3D object that they will end up being. For the sneaker, you also in the kit get a base to the shoe, and also a toe piece. The puzzle pieces fit into these to give it structural integrity. You can put the puzzle together by trying to be clever and work out which pieces go where, but there is a simpler way. One the back of each puzzle piece is a printed number and these numbers tell you how to put the sneaker puzzle together. Starting at the sole of the sneaker you work round and up – following helpful arrows that are also on the reverse of the puzzle pieces. It can be a little fiddly in places, but when you get the knack you can make quick progress. I did need to help seven year old LMC, but she was able to do a lot on her own. With only 108 puzzle pieces it doesn’t take too long to complete. Once the puzzle is completed there is then a plastic “bucket” like piece that sits inside the neck of it. Not only does this add further to the structural integrity, but also means that it works perfectly as a pen-pot. My daughter is thrilled with the finished sneaker puzzle. It now takes pride of place on her desk, full of pens and pencils. It actually looks really cool on there too. It’s also great to have a finished puzzle that serves a purpose too. Far preferable to it just being there to attract dust! 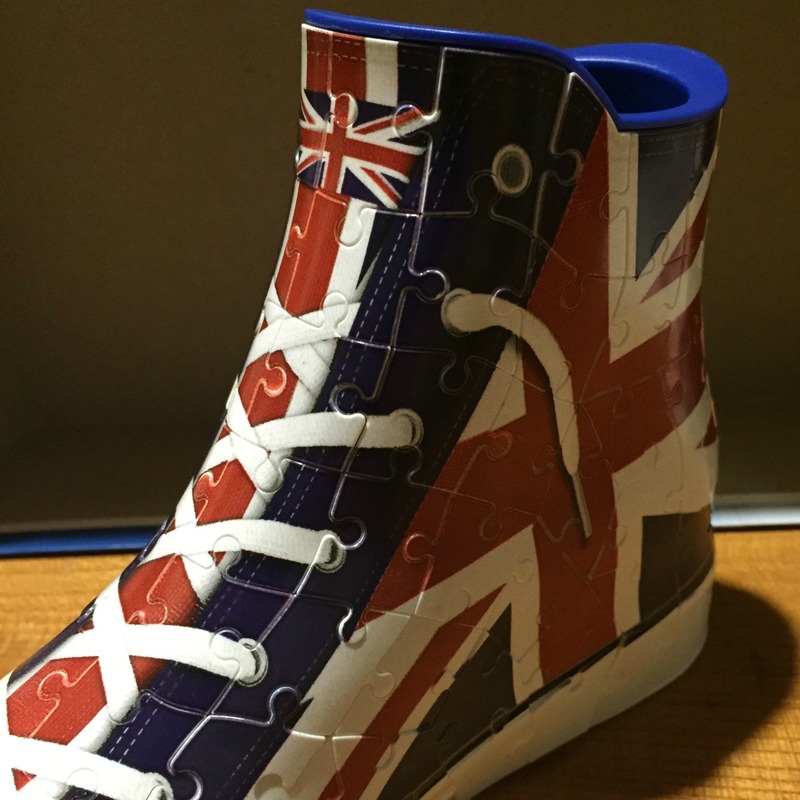 The 3D sneaker puzzle is available to buy online here. At the time of writing, it has an RRP of £14.99. 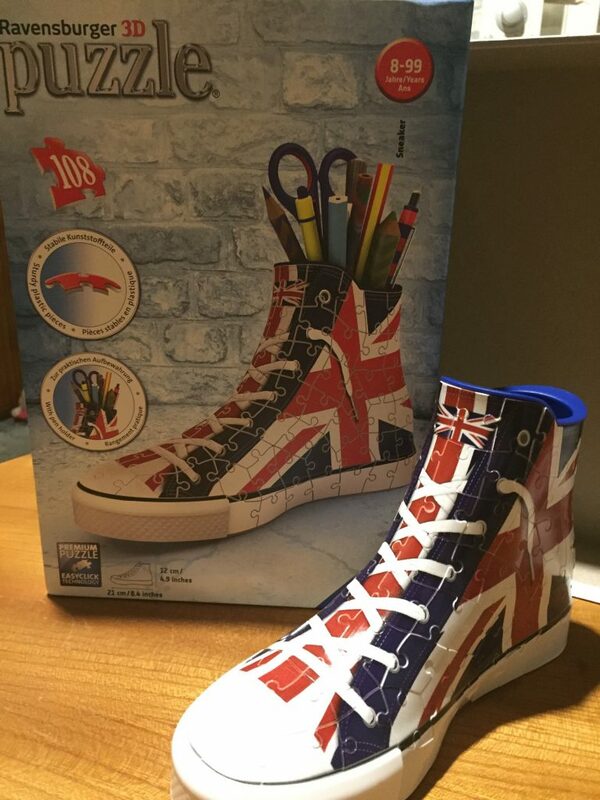 Disclaimer: We were sent this Ravensburger Unions Jack 3D Sneaker Puzzle for the purposes of this review. All opinions remain my own. This post contains affiliate links. Standby to see us play. Toy and games, gadgets and trains. We’ll be bringing you reviews of the latest toys and games, our retro game discoveries, geeking out over gadgets new and old, and totally geeking out over model trains.